A Monthly Magazine Devoted to Truth. 1/1, April 1937 (3/4 is April 1939). 25 pp. (8 /12 x 11 mimeographed), $2.00 a year. This journal appears to have been the work of a small, virtually unknown group of occult students in New York City. It almost certainly had an interest in A.S. Raleigh, probably through George W. Wiggs. 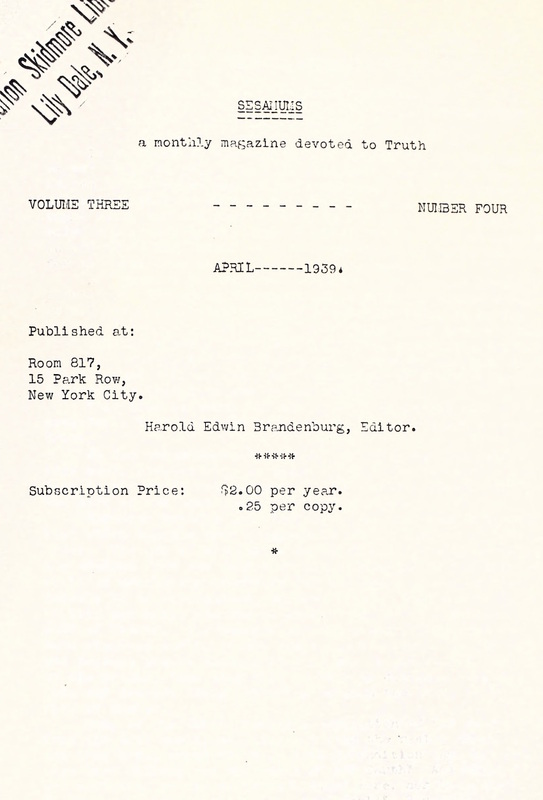 The April 1939 issue prints "Christian Mysticism versus Gnosticism" from "the unpublished works of" Raleigh and gives an obituary of Wiggs together with a lecture by him on "Psychic Activity." Wiggs was a joiner. He had published one of A.S. Raleigh's books, was a member of Max Heindel's Rosicrucians and the Temple of the People, and wrote for Azoth. The same issue also gives the obituary and a short biography of Wiggs' friend Delmar DeForest Bryant ("Adiramled"), who died on March 2, 1939 in Kincaid, Kansas. Contributions by Marie Harlowe, the editor of Telepathic Magazine (the successor of the Occult Digest), and by the otherwise unknown Millie Lukes, Theresa Snyder, Olga Steers, H. Alvin Burk, Andizia Landa Korzeniowska ("Salima"), and others. Harvard College Library (vol. 1, 1937); Skidmore Library, Lily Dale (3/4, April 1939).